Radiography is an integral part of paediatric health care. It is frequently requested to assist in the diagnosis, management and treatment of childhood disease and illness. 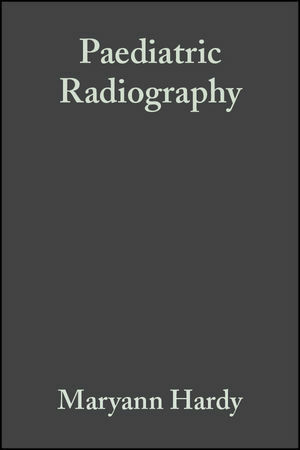 Accurate interpretation of paediatric radiographs can depend entirely on the quality of images produced by the radiographer, yet there are few books available on this crucial aspect of radiographic practice. Paediatric Radiography fills a gap. It explores radiographic practice within the context of the modern health service and focuses on how our knowledge and understanding of paediatric growth, development and illness can inform and influence radiographic procedures. It includes detailed coverage of specific paediatric techniques and good practice models, including the role of multi-modality imaging, and looks specifically at radiation protection, the chest and upper airways, the abdomen, neonatal radiography, trauma, orthopaedics, and non-accidental injury. Maryann Hardy is an experienced clinical radiographer and lecturer in diagnostic imaging at the University of Bradford with particular interest in paediatric radiographic interpretation and diagnosis. She is currently researching the role of gender, ethnicity and socio-economic status in determining the cause, type and severity of paediatric injuries. Stephen Boynes is an experienced radiographer and teacher with over fifteen years experience in teaching paediatric radiography to undergraduate students. He is currently the postgraduate courses coordinator in the Division of Radiography at the University of Bradford, and represents the Society of Radiographers on the Association of Paediatric Radiographers Committee.